Before I could walk, my heart had already been imprinted with the words, “Jesus loves me.” Faithful nursery workers rocked and sang on Sundays the truths I heard at home all week. I have always known I am a daughter of The King. And like any princess of position, I enjoyed mostly comfortable days unfettered by the worries of the kingdom — and largely ignorant of the happenings outside its safety. I flitted about carefree in the courtyard without fear of intruders. Or snakes. Or storms. I was blissfully confident in my Daddy’s ability to keep all things well. And while this may be the proper place for a child, an heir must eventually invest herself in kingdom itself. To step in the footsteps of His forgiveness in order to learn His gait. To listen carefully to His words in order to speak in His dialect. To receive His grace abundantly in order to cast its residue on others like He does. It’s time to learn the family business. Lord, tell me your ways. I come close and study His moves. His words. His patterns. His rhythms. I apprentice under the tutelage of The King. I Dwell. Linking up with Kelli and the other lovelies at Unforced Rhythms. I am pulled by the tides. Battered by the waves. Tossed about by circumstance. Worn down by the struggle. I forget all that I have learned about floating. And I surrender to the flailing. The attempted saving of myself from what feels like drowning in a sea of stress. Never considering to check if my feet could touch the bottom of what might simply turn out to be only a momentary pool of pressure. Gasping for breath. Thrashing my body from side to side. Reaching for an anchor. Settling instead for sugar. And what I already knew about myself and my drug of choice was proven true again. It only takes a little to make me want a lot. I allowed it for a day or two. It’s Christmas, I reasoned. Nothing more than I can handle, I pretended. Knowing with each and every bite that I had awakened my addict persona. And that she would not go down easily. I set my jaw, tensed my muscles, and lowered my head for the coming punch. But the punch did not come. The winds did not howl. The sea did not swallow me. And where I expected to be pushed face-first into the sand, Grace lifted me. Where my lungs had filled with salt-water, Grace replaced it with the Breath of Life. With a gentle hand, Grace set me on an island. A solid rock in the middle of the sea. Here the tides only ebb and flow at the shore. The waves do not overtake me. Here the breezes sing this song. Grace. Grace. God’s Grace. Grace that will pardon and cleanse within. Grace. Grace. God’s Grace. Grace that is greater than all my sin. p.s. I did not intentionally plan for my last post of 2014 to be focused on my Word of the Year: Grace. But it’s a fitting finale, indeed. I have found nothing anything close to comparable to selecting One Word each year to keep me focused. Partner it with a scripture, and the power multiplies. I’ll be announcing my 2015 Word soon, but I am spending these days praying that YOU would meet with The Spirit to come to agreement on One Word for the new year. And that you would have the courage to embrace it, then allow Him to unfold it in you over the coming days. The wonderful Kelli Woodford (Chronicles of Grace) is taking a well-deserved blogging break in December, but she has graciously let me borrow the Unforced Rhythm link-up community for the next few weeks. Your words are welcome here. So very welcome. If you stopped by here for the link-up, would you consider to connecting with me as well. On the right of this page you’ll find lots of ways to keep in touch. Just pick your favorite method of communication, and I’ll see you again soon! I simply cannot get over the beautiful truth that God chooses to be WITH me. The lengths to which He went — to which He continues to go — to position us forever next to each other. It is the message that has been moving in me most strongly this Advent season. That the promised One is coming. Indeed, that He HAS come. That Hope and Peace and Joy are fully satisfied in He who is Love. I know of no better version of love than this. God is WITH us. WITH is such a powerful, beautiful word. Not God over us. Not God under us. Not God ahead. Nor behind. Not sleeping. Not tiring. WITH. With means beside. In communion. Doing life together. God could have come to Earth in any number of ways. Demanding His rightful place. Making sure He could not be ignored. But he chose a baby named WITH. Because in spite of us being a rag-tag group of messy misfits, He just simply could not imagine NOT being with us. Not 2000 years ago. Not today. So whether or not you are with the ones you love this Christmas. Whether or not the gifts fit or the tree gets lit. Even if the Bumpus’s dogs eat your turkey. My fervent wish — my prayer — for you all this Christmas is that the WITH-NESS of God will overwhelm you. And His WITH-NESS will stay with you all through the year. Even when you’re almost 41. Even when it’s not the first time you’ve had your feelings hurt or your pride bruised or your confidence shaken. Even when every rational bone in your body knows the stinky breath of the enemy is the one whispering about your lack of worthiness. Even when you know he’s a lying snake. Even when you know Jesus and talk to Him often and have seen Him faithful over and over and over again. Even when you know His love is wide and deep and high and long. Even then there are moments of shock of how much this life can be unsettling. Like the first moment as a child you realize not everyone will like you. Because, up to that point, you never considered that not everyone spoke nicely and could be your friend. And you start to think it has something to do with you and hardly anything to do with the fact that people who walk around broken can’t help but cut each other with their rough edges. Maybe all there is to do in that moment is stop. And listen to some wisdom from the great Dr. Seuss. 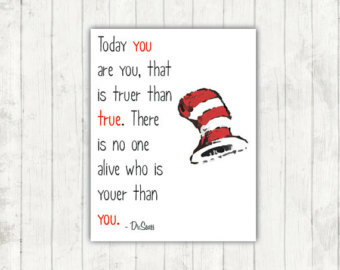 Today you are you; that is truer than true. There is no one alive who is youer than you. I’ll Just Be Beth. You Just Be You, friend. Because no matter what else happens today, you are still the best and youest you that I know. Sugar-free for 63 days, and I have reached the bargaining stage of my grieving its loss. Creeping as close as I can to its boundary. Nibbling the edges of sobriety by wondering if allowing myself the crumbs of something sweet would send me back to Day 1. Wanting my cake. And eating it, too. Looking to for the literal “sweet spot” where I can enjoy both satisfaction and sobriety. Which really isn’t the point at all. I have long known that true freedom from food addiction — a complete recovery — would have to be radically different from any diet or food plan or eating habits or exercise program I have used before. Because while some of them were helpful, even momentarily healing, none were a cure. Had they been, I would not be here now. Which my mind understood to mean that returning to my previous medications for my food wounds would not be enough. For a final clearing of the dis-ease between me and food, a complete heart transplant would be necessary. I have spent the last 63 days using various spirit-filled resources to aid in this transaction. The trading of pounds for peace. Choosing to overflow my soul instead of my stomach. Moving from death to life. I am slowly learning to distinguish between physical hunger and soul hunger and feed each appropriately. Food as fuel for an empty stomach. Jesus himself as sustenance for a growling spirit of stress, loneliness, boredom, or feeling out of control. I am eating my Daily Bread of His Word and lapping up the Living Water. I am tasting and seeing that HE is good. And still the struggle to surrender my whole body and its feeding habits is very, very real. For more than 40 Christmases, I have heard its story. A very pregnant Mary. A donkey ride to Bethlehem. A star-filled night. An over-booked hotel. A birth in a barn. A bed of straw. Animals and Angels. Shepherds and a Star. But I have always missed this part. From His first minutes of life as a human, Jesus made a way for us to be filled. Sustained. Satisfied. In every way. He would later testify that He came to bring us life. Abundant life. Not life full of tiptoeing around a buffet or beating our bodies into submission. But a life satisfied first and FULLY in Him. I admit I am still learning this process — discovering what feasting on the Lord and His Word and His Spirit means as it pertains to when to lift my fork and when to lay it down. But I can tell you this. My hunger is building. It has never rumbled in me more than it does today. Not for food. Not even for sugar. But for a moment with the King. The one in the manger.